Dithiothreitol (DTT) is the common name for a reducing reagent also known as Cleland's reagent. DTT is a particularly strong reducer because once in its oxidized state, it forms a very stable ring structure with an internal disulfide bond, which makes it harder to oxidize back to its reduced state again. DTT can also be used for reducing the disulfide bridge of the cross-linker N,N′-bis(acryloyl) cystamine to break apart the matrix of a polyacrylamide gel. DTT is a nearly 7-fold stronger reduction agent than βME (β-mercaptoethanol) and does not have the repulsive smell or toxicity of βME. 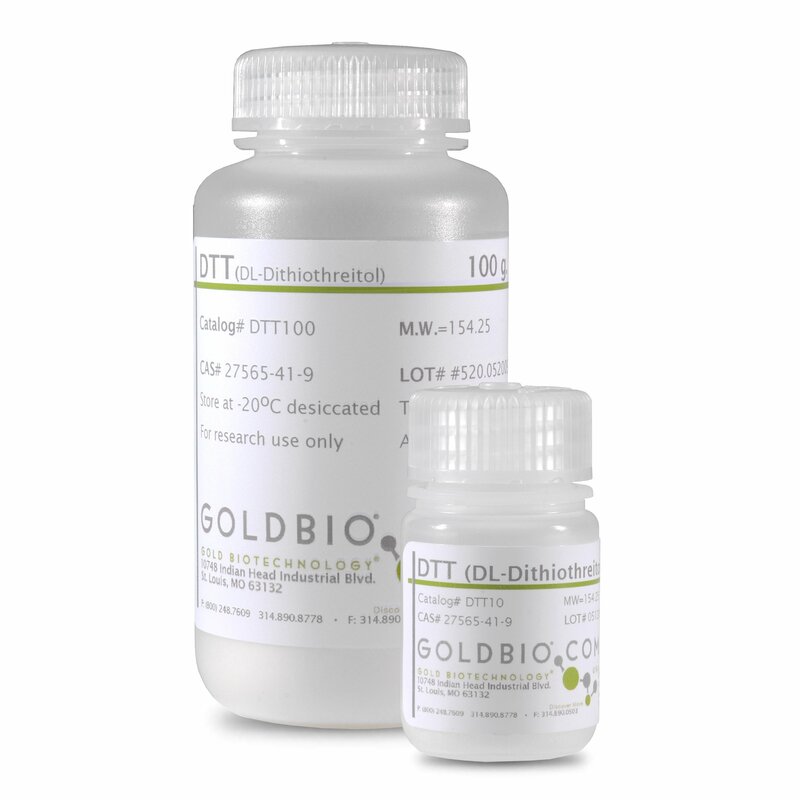 GoldBio’s DTT is the purest DTT on the market and is Proven and Published™ to ensure a quality reagent with optimal potential. Dithiothreitol (DTT) is the common name of the more popular of the two Cleland’s Reagents (the other being Dithioerythritol or DTE). DTT is a powerful reducing agent that forms a stable six-membered ring with an internal disulfide bond which is resistant to oxidation. DTT is often used for the following: reducing the disulfide bridge of the cross-linker N,N′-bis(acryloyl) cystamine to break apart the matrix of a polyacrylamide gel, the reduction of disulfide bonds in proteins, the prevention of those bonds from forming between cysteine residues and lastly, DTT is often used to reduce thiolated DNA in order to minimize dimerization. DTT is a nearly 7-fold stronger reduction agent than βME (β-mercaptoethanol) and has a less offensive odor and is less toxic.